Rolling out the holiday cheer – just like he rolled into the hearts of millions of adoring Star Wars fans – BB-8 is here! The latest piece Gentle Giant’s long running holiday collection is The Force Awakens “Holiday” BB-8 Mini Bust. These seasonal selections have become an eagerly anticipated tradition for fans and collectors of Star Wars and Gentle Giant Ltd. Caught up in the Holiday spirit – and a working string of lights – it’s hard not to smile when you see this genuinely cute sphere of cheer. Built from original film models and 3D data, BB-8’s revolutionary design and quirky childlike presence have been captured in this high quality, hand painted bust that is sure to brighten up your Star Wars collection, not just for the holidays, but all year long. 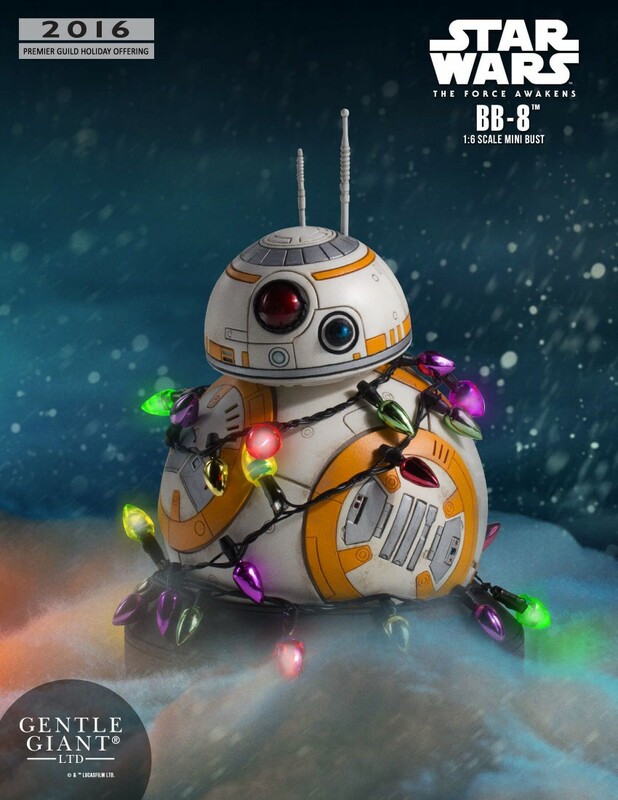 Inspired by art from Lucasfilm’s 2015 Holiday greeting card, this The Force Awakens “Holiday” BB-8 Mini Bust features permanently attached, long lasting colored LED lights. Each limited edition piece is numbered with a matching certificate to ensure authenticity. This collectible mini bust was made exclusively for Gentle Giant’s Premiere Guild collector club members, and is expected to sell out quickly. So if you’re not a PG member already, sign up and get your pre-order in today!